A pair of recent studies shows the unique responses of different whales to sonar, typically used by navies to detect submarines. Sonar sounds have been linked to hearing loss, deadly mass strandings and interference with whales’ communication with each other. One of the studies found that the distance the whales were from sonar sounds didn’t matter — they generally fled whether they were close to or far from it. 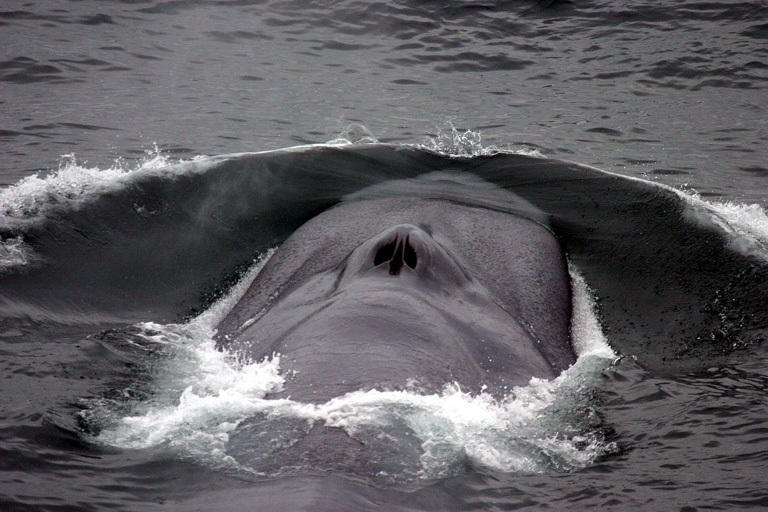 Another study showed that sonar affected the feeding patterns of deep-diving blue whales, but not those that were feasting on krill at the surface. Whales can behave quite differently in response to sonar depending on where they live and what they’re doing, new research has found. The pair of studies, on different species and in different oceans, adds to scientists’ understanding of how to protect whales from these sounds. Navies use sonar to detect stealthy submarines, and researchers have linked sonar training exercises to hearing loss, deadly mass strandings, and interference with whale communication. Most strategies to temper the effects of sonar use the volume of the noise as a guide, Brandon Southall, a biologist at the University of California, Santa Cruz, said in a statement. But loudness didn’t turn out to be the best predictor of blue whales’ (Balaenoptera musculus) responses to a series of sonar blasts in research published March 4 in the Journal of Experimental Biology. A blue whale creating a bow wave. Image by NOAA via Wikimedia Commons (Public domain). “Some whales responded when the sound was barely audible, while others seemingly ignored it and kept feeding at quite loud levels,” said Southall, the paper’s lead author. A separate study, on northern bottlenose whales (Hyperoodon ampullatus) in the Greenland Sea, found that these beaked whales — a group that’s among the most affected by sonar — changed their behavior, whether they were as close as 0.8 kilometers (0.5 miles) to the source of the sonar or as far away as 28 kilometers (17 miles). In that research, the scientists fixed data-gathering tags to 12 bottlenose whales and used underwater microphones to listen in on what was happening beneath the surface. A group of northern bottlenose whales rests at the surface in the Gully, Nova Scotia, during a research expedition. Image by Deepdivewhales via Wikimedia Commons (CC BY-SA 4.0). “All tagged whales stopped feeding, and individuals started swimming away from the exposure site for several hours when a certain sound level was reached, regardless of their proximity to the source,” Patrick Miller, an ecologist at the University of St. Andrews, said in a statement. Miller and his colleagues published their work March 20 in the journal Proceedings of the Royal Society B. Previous research has hinted that distant naval sonar wasn’t as bothersome to whales as the experimental pulses scientists use to investigate behavior change. 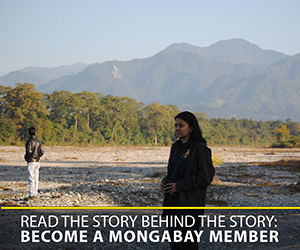 That finding didn’t hold in the “pristine environment” where Miller and his colleagues carried out their study. A blue whale from above. Image by NOAA Photo Library via Wikimedia Commons (Public domain). It’s possible that these whales, with little exposure to naval sonar, haven’t figured out that distant sounds don’t present the same danger as ones nearby, Paul Wensveen, a co-author of the bottlenose whale study and a University of Iceland biologist, said in the statement. Off the coast of Southern California, where Southall and his fellow researchers affixed tracking tags to 42 blue whales over five years, the recorded behavioral responses to experimental sonar were mixed. To round out their understanding of what was going on, several of the scientists used echosounders to pinpoint swarms of the krill that are the staple of a blue whale’s diet. 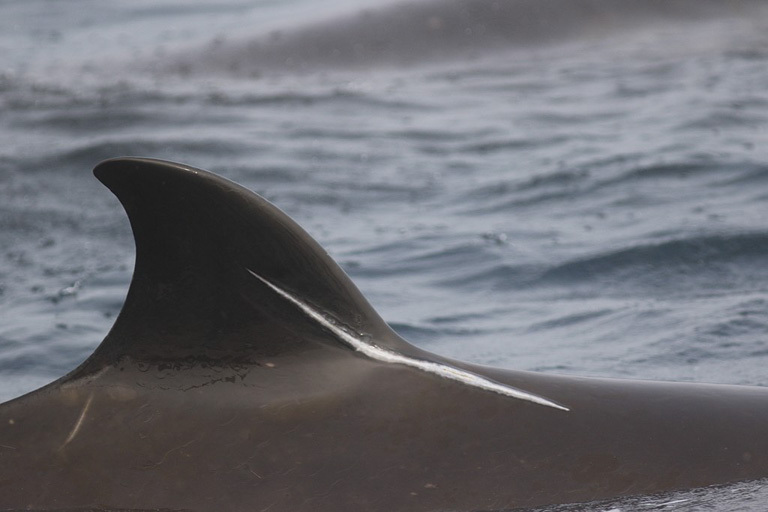 The dorsal fin of a northern bottlenose whale. Image by Deepdivewhales via Wikimedia Commons (CC BY-SA 4.0). Analysis of the data showed that, in general, whales feeding near the surface continued unperturbed when buffeted with sonar. But more than half of the tagged whales that were feeding deeper in the ocean abandoned their dinners — at least until the sound of the sonar stopped. Once that happened, most of the whales, which can grow to more than 30 meters (98 feet) and 200 metric tons (220 tons), set to feasting once again. 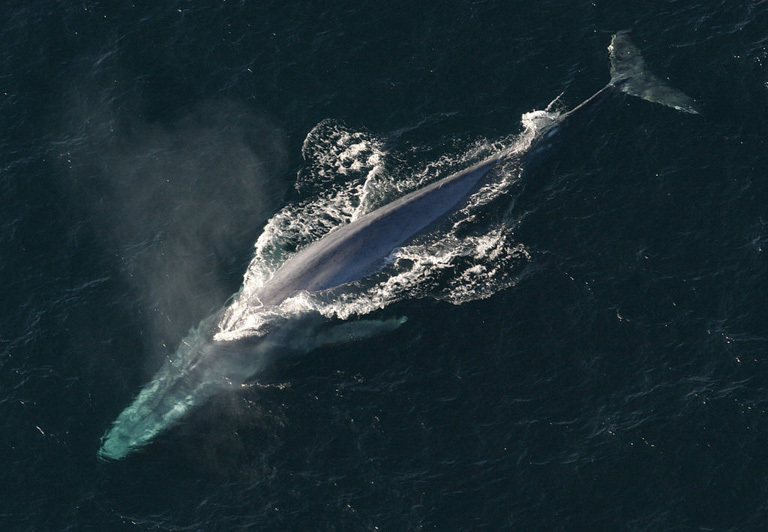 The researchers note that many factors could influence blue whales’ reactions to sonar. Still, Southall said, their findings offer a possible avenue to alleviate the effects of naval sonar tests. “Impacts could be minimized by reducing sonar disturbance during periods of blue whale foraging on deep patches of krill in the military’s main training areas,” he added. 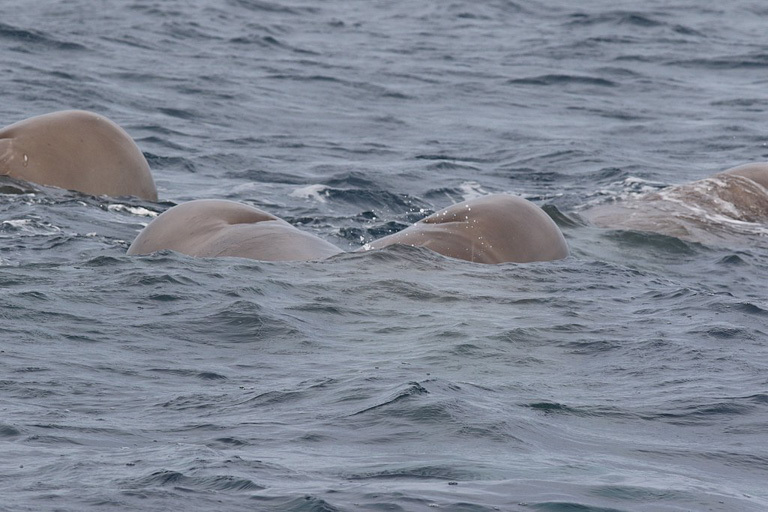 Banner image of northern bottlenose whales © Christian Harboe-Hansen. Southall, B. L., DeRuiter, S. L., Friedlaender, A., Stimpert, A. K., Goldbogen, J. A., Hazen, E., … & Harris, C. M. (2019). Behavioral responses of individual blue whales (Balaenoptera musculus) to mid-frequency military sonar. Journal of Experimental Biology, 222(5), jeb190637. Wensveen, P. J., Isojunno, S., Hansen, R. R., von Benda-Beckmann, A. M., Kleivane, L., van IJsselmuide, S., … & Narazaki, T. (2019). Northern bottlenose whales in a pristine environment respond strongly to close and distant navy sonar signals. Proceedings of the Royal Society B, 286(1899), 20182592.